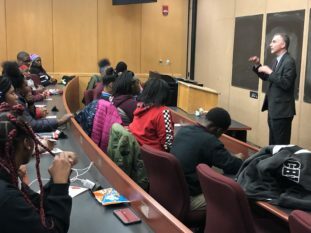 Interim Dean Mark Cordes welcomed students from the Chicago Legal Prep Academy on November 14, 2018. 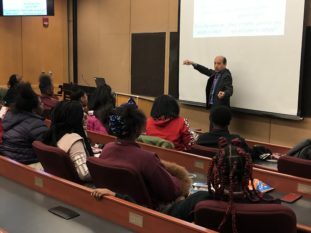 The charter school, located in the West Garfield Park neighborhood of Chicago, is Chicago’s only legal education-based preparatory high school. The school employs a unique, law-themed curriculum and culture of high expectations to prepare students to succeed at four-year colleges and universities. 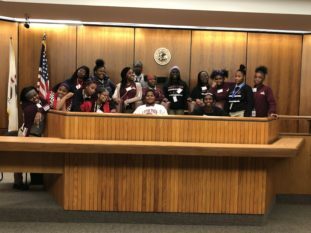 Hosting Legal Prep students at NIU Law for the seventh consecutive year were members of the Black Law Students Association and the Latino/a Law Students Association. 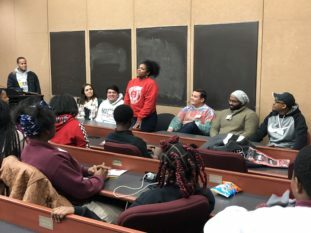 Legal Prep’s visit included playing a legal-themed board game, hearing an undergraduate admissions presentation, participating in mock class by Professor Robert Jones on freedom of speech, having a student panel discussion on the “Road to Law School,” and eating dinner at an NIU Residence Hall. The evening concluded with the students cheering on the NIU Huskies football team.